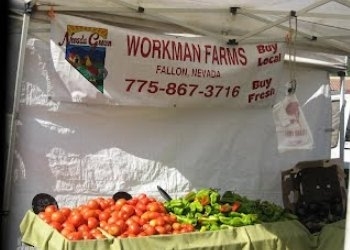 Workman Farms is just outside Fallon, off Reno Highway. Check them out on Facebook here! Salisha's Delicious sells at California & Booth St. Market. Call (775) 427-0832 to learn more, or visit their website http://salishasdelicious.yolasite.com/. Student Outreach Clinic (University of Nevada-Reno School of Medicine) - Call (775) 682-8646 to learn more, or visit their website http://studentoutreachclinic.org/. Shirley's Farmers' Markets - Call (775) 746-5024 to learn more, or visit their website http://www.shirleysfarmersmarkets.com. Wells Avenue Clinic - Call (775) 284-5004 to learn more. Call (775) 329-6300 to learn more, or visit their website https://www.chanevada.org/. Call (775) 688-1341 [Reno] or (775) 687-0101 [Carson City] to learn more, or visit their website at http://health.nv.gov/BEIS_EarlyInterventionPgms.htm. Call (775) 337-0296 to learn more, or visit their website at https://www.nndental.org . Call (775) 870-4343 to learn more. NEW! For a list of our Southern Nevada partners, click here!